I crocheted the Circle of Friends 8 inch square and just loved the pattern. 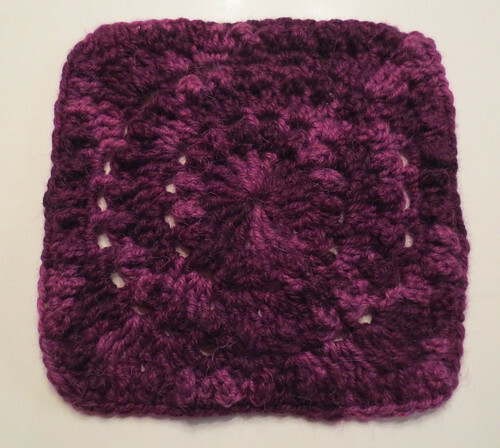 I decided to use this pretty purple square for the center of my preemie baby blanket. I’m participating again this year in the NICU Christmas baby blanket drive that Kathryn heads up each year. If you are interested, you can join us on Crochetville or through Facebook now. After crocheting the 8 inch square in purple Berroco Ultra Alpaca yarn, I added a round using a light-colored lilac yarn by working double crochet (DC) stitches around the square. In the corner, I worked 2DC, Ch-2, 2DC in each corner space around. I worked one additional round in the purple yarn before finishing the basic portion of the blanket in the light lilac yarn. I ran short of yarn so I added the edging using a Red Heart pale plum yarn by crocheting my scalloped edging that I first used on my scalloped baby hats. 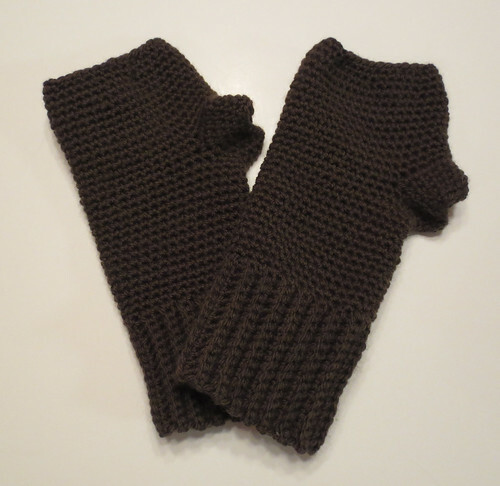 I used my simple men’s fingerless glove pattern to crochet these felted gloves. 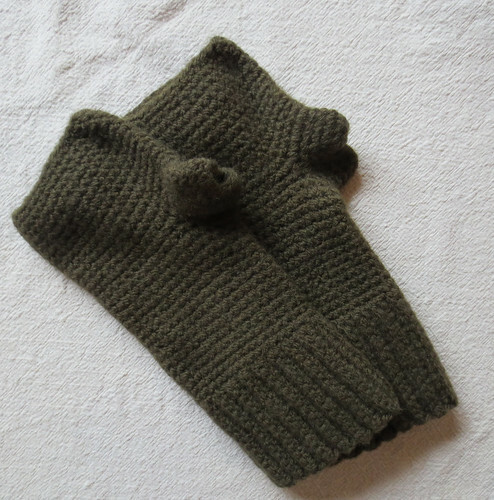 While the original pattern fits a man’s hand, these felted gloves fit a woman’s hand just fine after felting. They actually fit my hands okay before felting but now with the stitches felted, they fit even more snugly and are nice and warm. Here are the gloves before I felted them. I felted the gloves in a pot of hot water on my stove. I used a wooden spoon to stir them and agitated the wool to aid in the felting process. After the hot water bath, I did a cold water rinse and repeated the process one more time to complete the felting of the gloves. 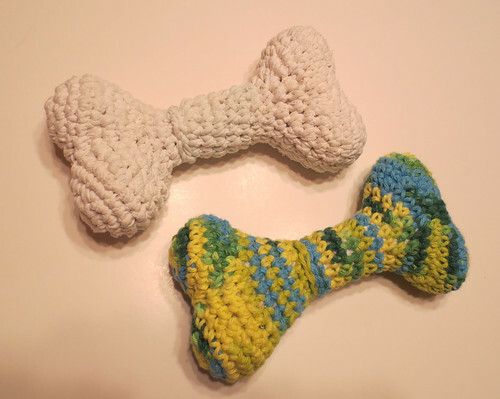 I crocheted two dog bone toys using this free dog bone toy pattern. I tried out the crochet pattern in the multi-colored cotton first. After working the pattern, I thought it would be a great project to work in recycled t-shirt yarn. I cut my t-shirt yarn using this tarn-making tutorial. My strips were cut thin as this helps make the material easier to crochet. Using t-shirt yarn about 3/8 inches wide and then stretched, it made a dog bone just a bit bigger than the cotton yarn one.